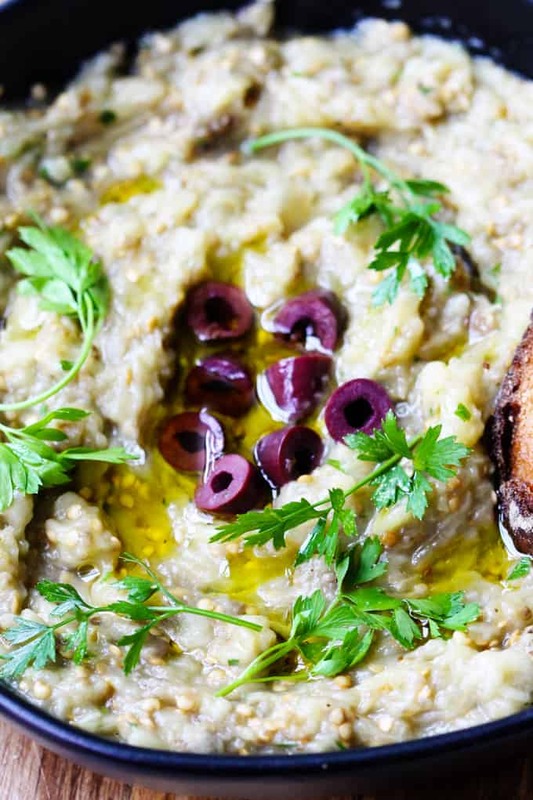 Melitzanosalata is a Greek Eggplant Dip that’s made from roasted or charred eggplants, garlic, onions, olive oil, lemon juice, and parsley. It has a chunky consistency and is usually served as a mezze (appetizer) with either a pita or crusty bread. If you’re looking for full emersion, you can top it with some Kalamata olives for an extra punch of flavor. Tirokafteri (Spicy Feta Roasted Peppers Dip). I love them all!!! And because we’ve got an abundance of eggplants from the local farms on Long Island, I was inspired to share one of my favorites: Melitzanosalata – which is really an amazing Greek eggplant dish. 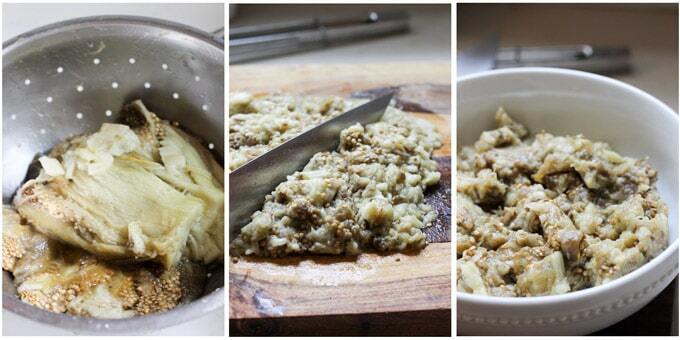 Below I’ll show you the ingredients and steps needed for this greek eggplant dish. Mind you, this is not the full recipe but is intended to show you how this dish is done. 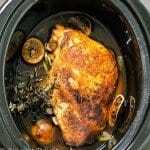 In order to get exact measurements, ingredients, instructions and nutritional information scroll down for the full printable recipe. (Optional) Smoked Paprika, & Olives for garnish. 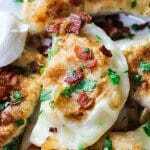 Again, while the printable recipe below will provide all the exact ingredients, measurements, etc…; I will walk you through how to make it here in a few easy steps. 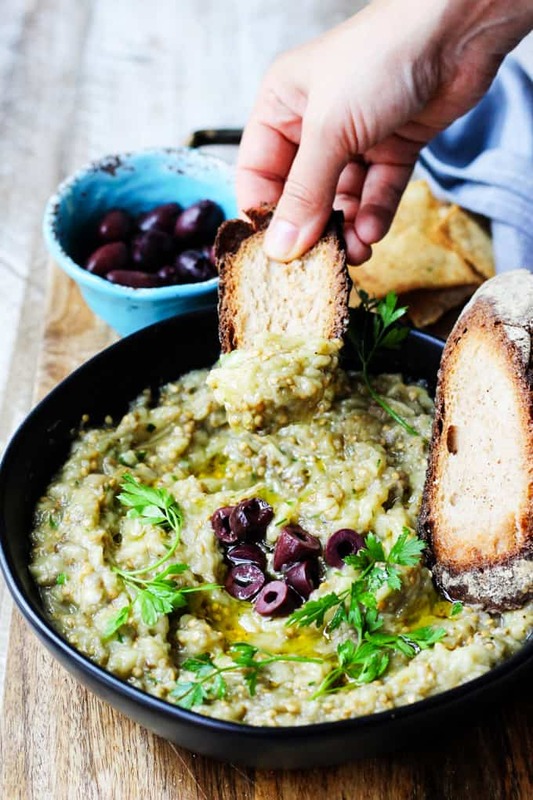 What’s the difference between Melitzanosalata and Baba Ghanoush? From my perspective, it seems like Baba Ghanoush is more widely known amongst Americans than Melitzanosalata. This isn’t surprising, especially considering that most Mediterranean restaurants serve Baba Ghanoush. However, Baba Ghanoush has an Arabic origin, and the primary difference with Melitzanosalata is found in texture and ingredients. Melitzanosalata is all about eggplant! 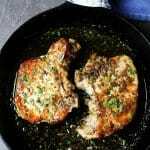 It’s the focal point of the dish and is left in its basic form. 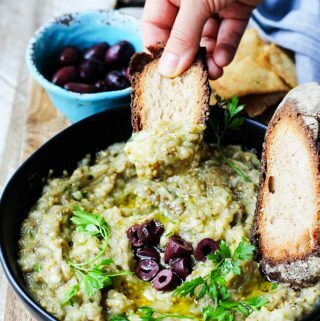 On the other hand, Baba Ghanoush has a totally smoother texture as it is typically processed with a fair amount of tahini. Now don’t I’m not picking favorites here. I absolutely love them both, but you can totally taste the difference. I wonder which one you’ll prefer. 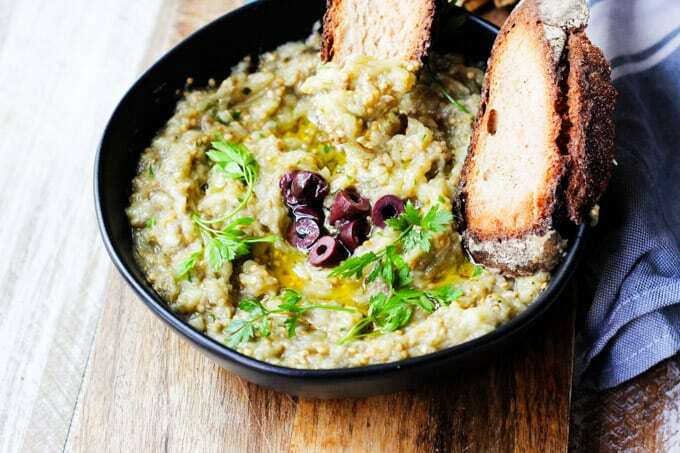 Melitzanosalata is a Greek Eggplant Dip that is made from roasted or charred eggplants, garlic, onions, olive oil, lemon juice, and parsley. It has a chunky consistency and is usually served as a mezze (appetizer) with pita or crusted bread. You can top it off with some Kalamata olives for extra flavor. Serve as an appetizer or mezze with olives, crusty bread or pita bread. I love using aubergine to make a dip not has such a nice texture. That looks so warm and comforting! Yummy! Cannot wait to try this. Thank you for a great recipe! This is a great dip recipe for entertaining. Different and so delicious! 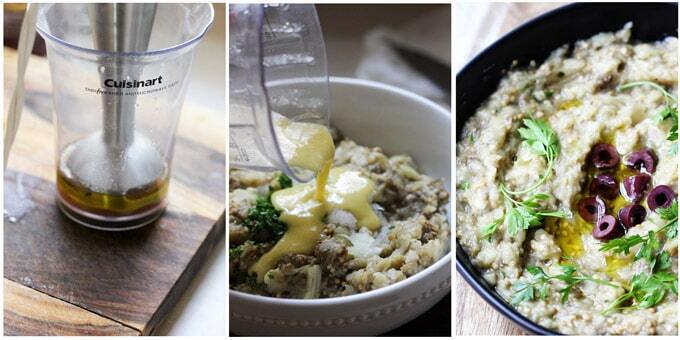 This combination of ingredients is just divine! 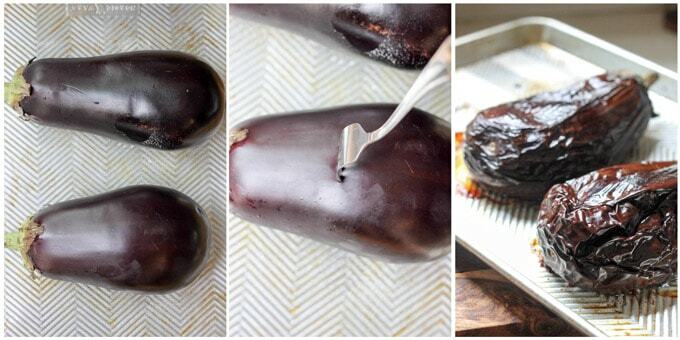 I have a few more eggplant still growing in my garden, so pinning to try this later! Awesome, thanks Danielle. I hope you’ll like it. Great use of recipe! This dip looks so delicious! I can’t wait to try this!!! I shared on my facebook page! 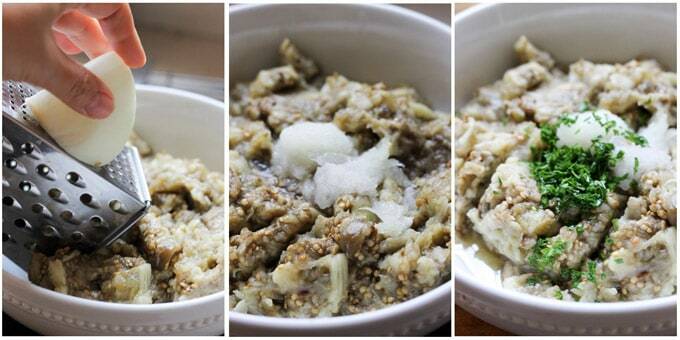 Thank you so much for sharing this eggplant dip! Can’t wait to try this at home. Been wanting to make my own eggplant dip for ages! Thanks Billy! I hope you will like it!